The Black Cauldron would be cool. 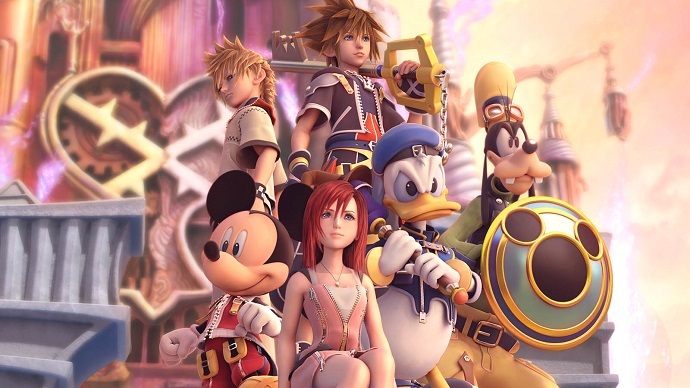 Name your top three picks for KINGDOM HEARTS III Worlds :]. worlds I want: Frozen, The Princess and The Frog, Alice In Wonderland worlds which will be in it: Frozen, Wreck It Ralph, Chicken Little I'd say Chicken Little is the wildcard because it's a relatively underrated Disney movie but CL was a summon in KH2. What Disney movie would make the best new musical world in KH? Alice in Wonderland. I think it would fit well since the music is pretty dreamy and classic Disney. I think if there was another musical world that it should be music + action since Atlantica in KH2 was pretty boring. How Many Worlds in Kingdom Hearts 3? I think we'll have 13 worlds. Frozen, Moana, Zootopia, Treasure Planet, and maybe Cars or the Jungle Book will be the final worlds revealed. What KH song / theme is the best for starting an event? Hikari Ray of Hope or KH3 theme. Will a new World be revealed at the KHUX Fan Event and if so, which one? Treasure Planet or Chicken Little. I have a feeling that Moana, Zootopia, and Chicken Little will all be worlds. If Utada doesn't come back, who do want to do the KH3 song? Spirited Away, Howl's Moving Castle, Laputa, and My Neighbor Totoro would all be great worlds. I'd love to see a Totoro world and how they would execute and the same thing with Laputa. I'd love to explore the castle and see all the details that they create it would be magical. If Sora could get one Disney Boss as a Summon, who’d you choose? I chose Chernabog but I also think Monstro could be a cool summon. I think the world's that reman untouched could be Moana and Zootopia. A huge maybe but it would make a lot of sense. I believe most of the world's are finished as well but it could be that they want to put those 2 worlds in the game. What's your favorite movie of 2017? I liked Girl's Trip and mother! a lot. I only saw a small bit of Wonder Woman but it was really good. Frozen please. Story cutscenes. A few new worlds. A sneak peek of the final battle. I hope that an original song is played from the game too.